Syrian troops shell rebellious areas in central and northern Syria in the latest push to quash the uprising against President Bashar al-Assad, but faced fierce resistance from army defectors, activists say. Syrian troops shelled rebellious areas in central and northern Syria on Saturday in the latest push to quash the uprising against President Bashar al-Assad, but faced fierce resistance from army defectors, activists said. Much of the day's fighting focused on the northeastern town of Saraqeb, which activists said regime troops and tanks entered from the north amid heavy shelling. 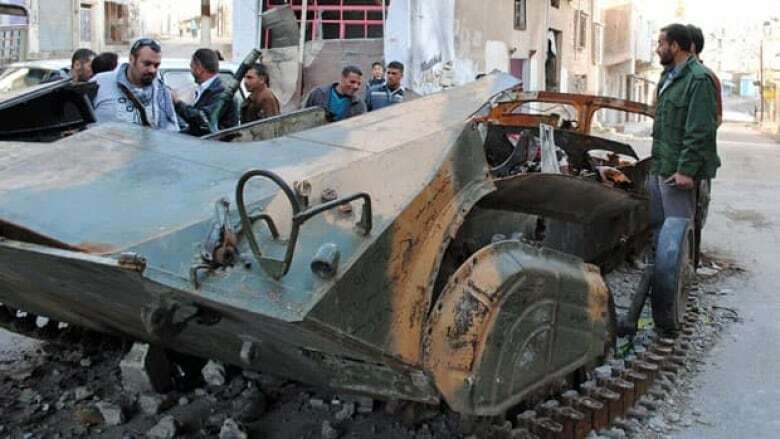 The Britain-based Syrian Observatory for Human Rights said fighting reached the central market district where army defectors damaged a tank and three armoured personnel carriers. Late Saturday, it said 2 rebel fighters and 9 government troops had been killed in the clashes. "Large numbers of residents are fleeing the town," said Rami Abdul-Rahman, who heads the Observatory, which has a network of activists inside Syria. "People have been leaving the town for some time but after today's attack the process intensified." Government troops also shelled parts of the central city of Homs and the nearby town of al-Qusair. Activist videos posted online Saturday showed explosions in residential neighbourhoods sending up balls of flame and huge plumes of black smoke. The Observatory said 10 people were killed Saturday in Homs province. Another group, the Local Coordination Committees, put the death toll there at 22. Both said more than 40 people were killed nationwide. Syria's government has been on the offensive over the past two months and has pushed rebels from a number of strongholds: The provincial capital and other towns in the northwestern province of Idlib that borders Turkey, the central provinces of Hama and Homs, and the eastern oil-rich region of Deir el-Zour that borders Iraq. Syria's rebels, who took up arms following the regime's crackdown on protesters, are outgunned by armoured units loyal to Assad, but have adopted a tactic of hit-and-run strikes on security checkpoints and convoys. They killed at least 6 soldiers in such attacks on Saturday, the Observatory said. The Syrian government cites the rise in such attacks to boost its argument that the uprising is being carried out by terrorist groups acting out a foreign conspiracy. 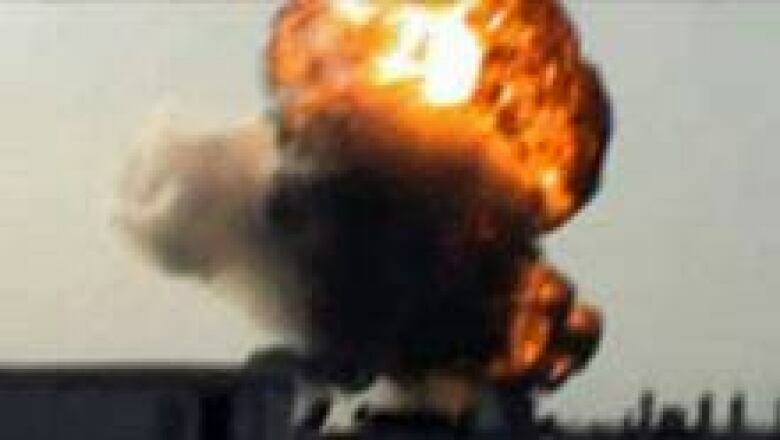 The Syrian state news agency said an "armed terrorist group" blew up a natural gas pipeline in the country's east on Saturday, causing the leakage of 700,000 cubic meters of gas. The agency said the pipeline feeds a fertilizer factory and electric plant in Homs, and that the damage would take three days to repair. The LCC said the troops that entered Saraqeb were accompanied by pro-government gunmen and plainclothes security agents who arrived in buses and started conducting raids and detaining people. Calls to the town could not get through. The government is known to cut networks in areas where operations are under way. Saraqeb, in the northern province of Idlib, had been held by army defectors for months. The attack came 11 days after troops retook the city of Idlib, the provincial capital, which had also been under rebel control for months. Activists said troops also pounded the town of Qalaat al-Madiq in Hama province with mortars and heavy machine-guns. International condemnation and high-level diplomacy have failed to stop the year-old Syria crisis that the UN says has killed more than 8,000 people, many of them civilian protesters. The U.S., Europe and many Arab states have called on Assad to stand down, but Russia and China have protected Syria from condemnation by the UN Security Council. Earlier this week, the council passed a nonbinding statement calling for a ceasefire to allow for dialogue between all sides on a political solution and the delivery of aid to suffering civilians. An adviser to Russian President Dmitry Medvedev said Saturday the country seeks a political solution. Sergei Prikhodko said Moscow's top priority for Syria is to halt to the violence and persuade the opposition "to sit at the negotiating table with government representatives and reach a peaceful resolution of the crisis." Joint UN-Arab League envoy Kofi Annan is to discuss the crisis with Russian official in Moscow on Sunday.